In main event action, a four round junior welterweight contest, junior welterweight HyeFighter Artur Bernestyan outclassed and outworked gritty challenger Demetrio Soto. 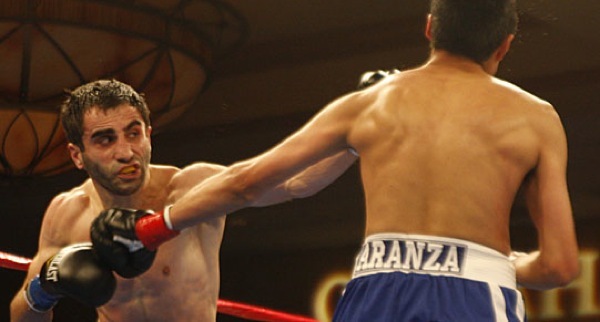 Bernestyan, a fleet footed and fast fisted southpaw, worked from all angles, boxed well, traded when he had to and left little doubt in the eyes of the judges who each scored the fight 40-36 in favor of Bernestyan, originally of Armenia but now fighting out of Glendale, California. The Armenian fighter was able to pile up the points by way of his jabs, uppercuts and body work, including one body shot that sailed below the belt and caused a 1 minute break in the action while Soto recomposed himself in the corner. While neither fighter was seriously hurt by a legal blow, it was a good action fight that the 1,312 sellout crowd in attendance appreciated. With the victory, Bernestyan remains undefeated and raises his record to a perfect 6-0 (2KO) while Soto drops to 5-3 (4KO).